After getting a day off, the 492nd took to the air again to support the assault forces in Normandy. 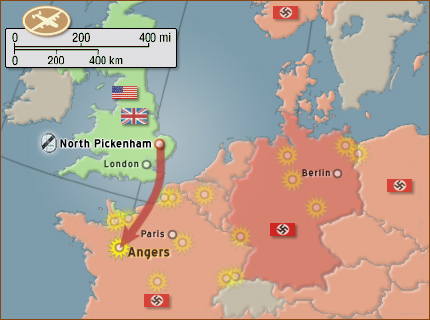 Of the 21 objectives targeted, the Group drew a railroad junction in Angers, France. Major Losee, the 856th Squadron Commander, led the Group flying on one of the two Pathfinders provided. Of the 44 ships dispatched by the 492nd, only 36 of them initially recieved sortie credit. Between bad weather and a last second change in the assembly instructions, 10 planes weren't able to find their own formation. Some did hook up with another group, but we don't know how many. Those crews weren't credited until several months later, after they had finished their tour. Normandy airspace was owned by the Allies. The 8th and 9th Air Forces sent up over 2,700 fighter sorties to cover the Normandy coast. The Heath War Diary states that they did not encounter any flak or fighters, but they weren't with the Group. However, the 8th Air Force did lose 3 heavy bombers so there was some danger lurking about. The initial 492nd monthly summary shows that 33 of their ships attacked the target. But since some of the planes weren't with the Group it's hard to say how many really did. The Heath War Diary mentions that they could visually see the target. Makes us wonder if the Group used their bombardiers instead of the Pathfinders. This was the greatest number of airplanes that the Group ever sent up on one mission. According to the records, the commanders viewed it as a makeup day since they weren't sent up the day before. Perhaps everyone wanted to cash in on the easy ones. A new rumor began spreading around the base that the 492nd was going to be downsized to three squadrons. One of the squadrons was going to be transferred to a base near London. Of course, everybody wanted to go because they would have easy access to London. But those who really knew what was going on, weren't saying anything.